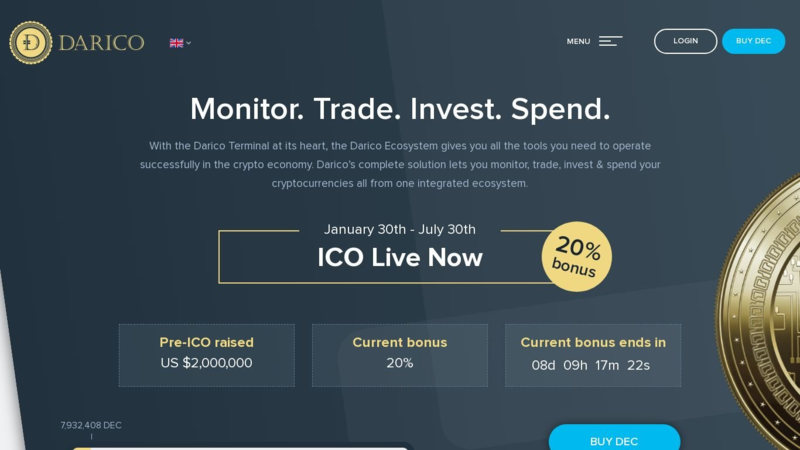 DARICO is a platform that empowers the users by giving them a professional and user friendly investment tool that enables them to monitor, trade, invest and spend their crypto currency with confidence. The Darico Ecosystem Coin is a utility token which has been designed specifically to empower people by providing them with professional-standard and user-friendly investment tools, which enable them to make informed cryptocurrency investment decisions. Holders of Darico Coin will receive exclusive access to the entire Darico ecosystem, including the wallet, terminal, liquidity pool, Index Fund, debit card and exchange. In addition to that, the Liquidity Pool plays a critical role in providing sustainability for the Darico Ecosystem, and allowing continuous growth. With the Darico Terminal at its heart, the Darico Ecosystem gives you all the tools you need to operate successfully in the crypto economy. Darico’s complete solution lets you monitor, trade, invest & spend your cryptocurrencies all from one integrated ecosystem. Carry your crypto with you at all times. The Darico debit card allows instant access to your crypto funds whenever and wherever you need it. With the ability to spend or withdraw your crypto for everyday fiat transactions, the debit card enables you to integrate crypto into your daily life. A diversified portfolio of highly liquid cryptocurrencies that will be monitored, analysed and rebalanced on a weekly basis. The Darico index fund will help to ensure that the Darico portfolios remain liquid and profitable. Bringing together a community of crypto enthusiasts, the Darico Terminal is the gateway to access the Darico wallet, Exchange and Index Fund. The Terminal provides users with news, trading, index information and more; crypto trading has never been easier. Developed to benefit the entire Darico Ecosystem, the Darico liquidity pool is made up of BTC, ETH and Gold, and will be utilised to keep the Darico Coin and Ecosystem liquid.The liquidity pool is there to ensure the stability for DEC holders for the long term. Easily accessible via the Darico Terminal, the Darico Exchange will offer all crypto enthusiasts the ability to trade, deposit and withdraw a variety of top-ranked cryptocurrencies. The Exchange will also enable cross-trading between cryptocurrencies and fiat currencies, helping to improve the crypto experience. The Darico ICO is running from the 30th January – 30th July.